This month is all about thankfulness. It is a great time to talk to your kids about why you and your family are so blessed and how to be truly thankful for what you have. Using some sticks and some paper bags I created a tree that will give us an opportunity each day in November to talk as a family about why we are thankful. I talk to my kids a lot about why they should be thankful, and I sometimes feel like it goes right over their heads. They are young, and what is important to my husband and I isn’t always what is most important to them. We did a project earlier this month where I found out my kids were thankful for things like Mario Cart and candy. I understand that at their ages they can’t grasp that those material things aren’t important at all. I wanted to find a way for us to talk about what IS really important instead of the “things” that we like. That is what inspired me to create this little tree. It is never too early for your kids to start leaning to be thankful. 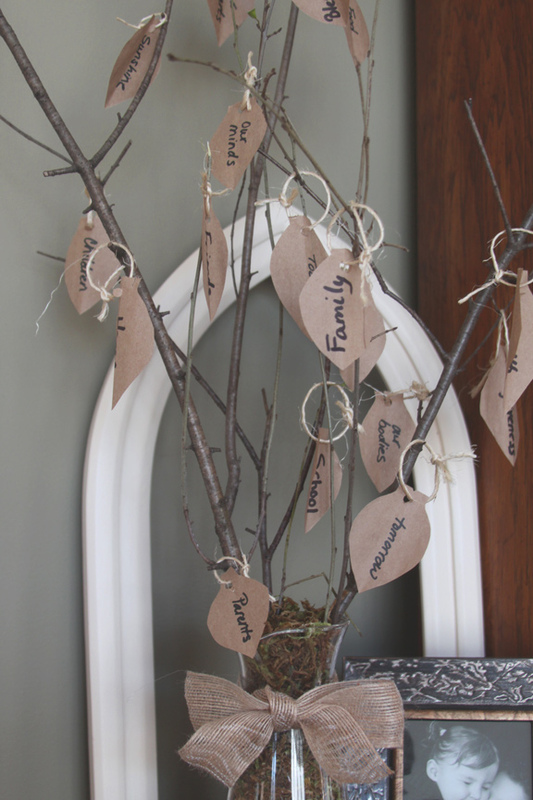 This thankful tree is a great way for us to start conversations with our young kids about why we are so blessed and why we are thankful for the simple things that life has to offer. I came up with 30 things that we are thankful for as a family. The tree consists of 30 leaves each with an important word on it – something that we are thankful for. Each day in November we will be removing one leaf and talking about why the word on the leaf is important, why we are thankful for it, and how it affects our lives. I decided to make this tree to help us celebrate November and Thanksgiving but didn’t want to spend any money. I found things around our home to create a tree that would be natural and pretty enough o leave up all month long. We went outside as a family and collected some branches. They had the perfect little spots to hang our leaves on. 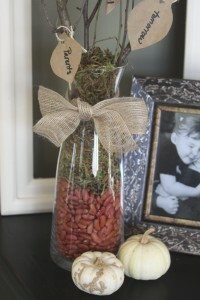 To make our thankful tree I took a few sticks from outside and put them in a vase filled with kidney beans. The kidney beans main purpose was to help hold the sticks in place. I covered the top with some moss that I had on hand. To finish it off, I used a piece of burlap ribbon tied in a bow around the vase. 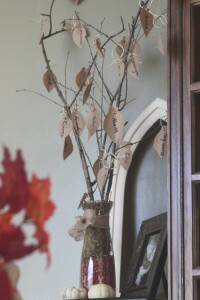 The leaves were cut from folded up brown paper bags. 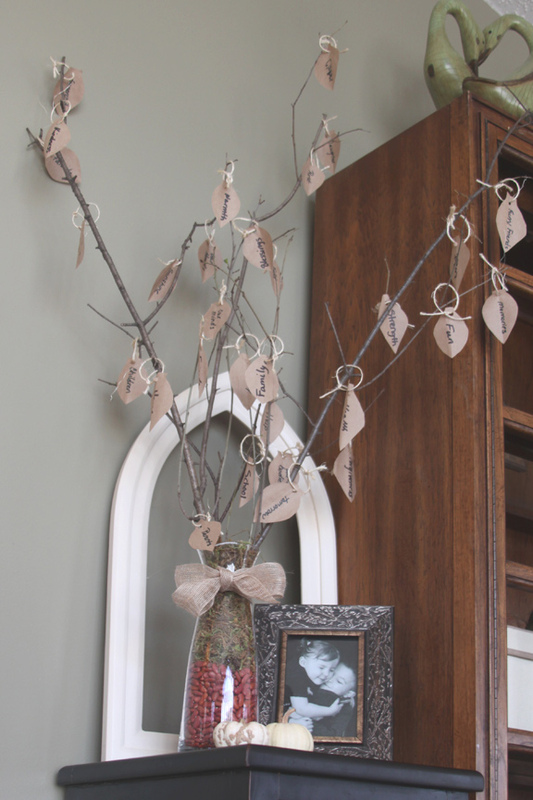 I put a hole in each with a hole punch and used a small piece of twine to hang them onto our branches. I wrote our 30 reasons to be thankful onto the leaves using a permanent marker. I love how the colors are natural and help celebrate fall. 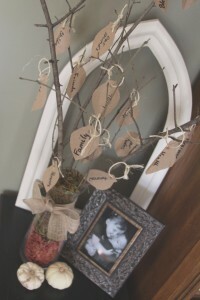 The full tree of leaves starts the month and as the days pass the tree loses it’s leaves. It is a great way to show and discuss the leaves falling before winter comes with your kids as well. This is symbolic and pretty piece of fall decor that will give us the opportunity to talk as a family each night about our blessings. We usually sit around the table after dinner and talk about the leaf of the day. The kids enjoy picking the leaf and I have been surprised at how long we end up sitting and talking together each day. It’s not too late to start this in your home this month. 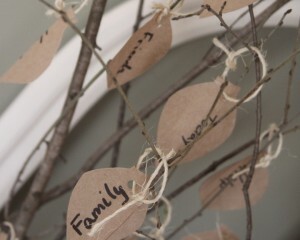 Just add a leaf for each day left or do a couple leaves each night – either way I hope you take some time to sit with your own families and talk about what you are thankful for and why! I think this may be my favorite idea yet! You know I love all the ideas you share here but this is so meaningful and beautiful. What a fantastic way to start teaching your kids so many great values. I definitely want to do this when we have our own kids. I like that you shared what you put on each leaf too, because sadly enough at first I wasn’t sure if I could come up with 30 mostly intangible things. But now I see what great discussions you can have from each leaf. It also seems like a really good way to teach kids to enjoy talking as a family rather than running off to play immediately after dinner. Thanks for the great idea. How wonderful to teach children thankfulness….the world would be a better place for us all if these basics were instilled in our children at home.